Posted by peterong in food, Lower East Side. 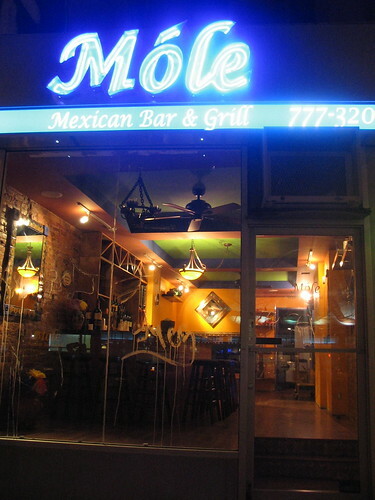 After a quiet post-Thanksgiving Dinner at the highly tauted Mole, the Mexican eatery around the corner on Allen Street, I thought about the emails I am getting about my blog and how I have not updated. So, here is my promise, I will have a weekly posting on each Monday night. Things have been busy and the thoughts I have are some times too heavy for a casual entry so I often find myself forming words and narratives that leave me paralyzed…so I don’t write. But realizing that I don’t have to have a life altering entry but some updates on life and food! So here I go! enjoy. As I mentioned before, Jamie and I went to Mole , we have walked by it a number of times but never ventured it since it always seems so crowded and happening. We peered in and it was around 8 pm with some seats and we thought, why not! It is a modestly decorated with some vibrant energy. When you walk in, the first thing you notice are the bricked walks with the mosaic Mexican masks. We are greeted by Nick, the proprietor and the gatekeeper of the bar. some Mexican food and had wonderful Ceviche appetizer (pronounced Sa-Vee-Chay). It was a seafood one with what the waiter described garnished with what our waiter said “octopus that melts in your mouth.” We ordered it and it was wonderful (such an amazing lite fare) except when we asked for more tortillas, they took our Ceviche away! But the owner and manager, a hearty man named Nick noticed our dismay and went to the kitchen and got us another order…it was yummy. Jamie ordered a Chimichanga (which I had no clue it was a fried burrito! this reminds me of my experience with Donuts…”they are fried?”) with a margarita and I ordered a flounder with shrimp on a lime jalapeno sauce over banana leaves. I tried Jamie’s Chimichanga and it was fun but a bit overwhelming with the white sauce. My flounder was not the freshest but the lime spicy sauce made my mouth tingle for the rest of the meal (which is not a bad thing). Jamie couldn’t finish her Chimichanga and we packed it to go (our tummies were pretty full from the extra Ceviche that Nick generously provided for us). Overall it was a wonderful meal and it was our first date in awhile. I would recommend that you check it out and one of the fun parts of the experience is the table-made guacamole! I made a silly joke about the Chinese translation for Mole is “Don’t bother” or “Ignore.” Jamie gave me a half-hearted smile. We will be back again for some Ceviche and more of the wonderful fare. Went home and watched some more episodes from Lost (Second Season) and waited for our friend Claudia to show up from her trip around the town. Jamie and I shared some reflections on our past few days and slept…and we feel so blessed. So very blessed and can’t wait to eat the leftover Chimichanga.